Sandy Beaches, beautiful rain forest, year round warm weather, family, fun, love. All of these words can be used to describe a luxurious trip of a lifetime, offered through Vacation Rentals St Lucia. Start planning yourgetaway now and save big with this season’s hottest deals brought to you by Vacation Rentals St Lucia. Because they offer the best packages this side of the web! We are the number one source for your next escape, presenting the best deals around the web at affordable prices for the family, couples or groups, even singles! We are here to provide a one stop shopping experience to booking your escape to one of the world’s most beautiful destinations, Saint Lucia. Call us today to find out about some of this season’s exclusive deals. With the colder months approaching, don’t wait to contact us to warm up your spirits. Destination St. Lucia averages a temperature of about 80 degrees Fahrenheit year round, that’ll keep you warm! A vacation is one of the best way to relax and de-stress when things get tough and you need a time for a “me” moment. It enables you to spend some time with the people you love and appreciate instead of working continuously year after year. Everyone needs to take at least one vacation a year in order to stay productive and get the most out of their life. Everyone loves holidays and part of the fun of the process is making up your mind up about where to go. You can have memorable outings if you travel with your family and you can have a lot interesting fun if you go with your friends. Which-ever way you select to enjoy Saint Lucia – the island simple rock. The island of Saint Lucia is the ideal place for your next perfect vacation, destination wedding or honeymoon. St Lucia offer some of the best packages include a delightful blend of activities, amenities and facilities on this small island paradise. 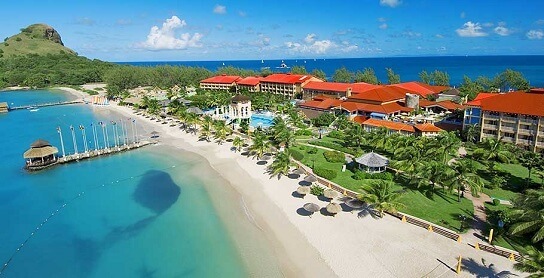 If you’re looking for a first- class Island with first-class service St Lucia is the place for you. We will ensure you have more than a vacation booked but an experience with lots of adventure and all the accommodation Saint Lucia Island has to offer. Let the island of romance and luxurious attraction warm your hearts and let us ease your pockets by booking your getaway today! About the author: Andrew Prince is the sales and marketing contact at Vacation Rental St Lucia . We got the perfect space for you. We are an on line professional marketing agency for the finest resorts, vacation rentals and holiday homes across the Caribbean island of St Lucia. We provide some the finest accommodation and tours options on the island of Saint Lucia. Contact us today. Share this article on Facebook, Twitter in you find it helpful.